I am not new to blogging, but I am new to self hosting! I recently (December 2013) switched my blog over to a self hosting domain, and am working on growing it even more – which is certainly a new adventure! I am going to make weekly updates to new things that I learn – about blogging, food, and myself. I want to share the steps I took, (both good and bad) to help you grow yourself, or to keep you off of stumbling blocks that I run in to! 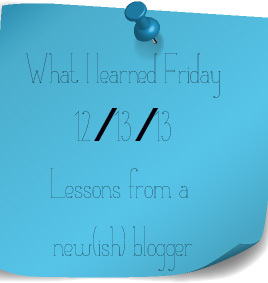 So, check back each Friday for my [What I Learned Friday] list! Since this was my first week of the ‘switch’ I learned a million things, but I wanted to keep the list manageable! So here are the top things I learned this week! People really, seriously, want to help you. This one surprised me. Maybe I’ve been working in ‘corporate world’ for too long. But, when I started looking for resources on how to start a food blog, they were everywhere. And everyone was willing to tell you all about how they started the process, what worked for them, and what didn’t. Two people I really enjoyed reading about was Pinch of Yum, who’s blog has amazing resources along with monthly income reports! And 100 Days of Real Food (and her husband’s new blog). 100 Days of Real Food was my original inspiration to change our diet years ago, and I’ve loved watching her blog grow! Transferring content from wordpress.com to wordpress.org actually isn’t scary, at all. In fact, it was really easy. I followed this tutorial, and it worked flawlessly. In the same respect, setting up domain hosting through Media Template was also super simple. Even though setting up my domain and transferring my content was incredibly easy (took about 3 hours to get everything up and running on the new site) – I still feel amazingly proud of myself for doing it all on my own! My self-taught IT skills are finally starting to pay off! I need to step up my food – photography game. I’ve been browsing (and drooling!) over other people’s photography! Lesson number one – my (green) counter top is ugly. Find something to cover it. PRONTO! I’d call that a pretty productive week! Nice job.